Woe be to the Flow columnist that sets out to write about how convergence is changing television comedy without acknowledging what might be the biggest success story of convergence comedy, the Nickelodeon sitcom iCarly. Now, iCarly might not be this media scholar’s preferred convergence culture, but it is most certainly his 10-year-old daughter’s. It is what she is watching repeatedly on the DVR or on a laptop at her friend’s house, and it is the overflow she is reading online by following characters’ blogs that may or may not tie in directly to the episodes she knows by name. iCarly is about a tween-age girl, Carly, who produces her own webcast with friends Sam and Freddy. Think Wayne’s World meets Hannah Montana meets Frasier, since the gang produces the show in the Seattle condo where Carly lives with her older brother/guardian, Spencer. Most episodes of iCarly revolve around the production of the program: iCarly solicits videos for a dancing contest; the gang tries to set a world record with a 24 hour webcast; Carly tries to impress an influential blogger so he’ll write a positive review of her show, and so forth. One of the convergent “hooks” of the show is that in most episodes Carly gives an assignment to the viewers–for example, to make videos of themselves dancing. This fan-produced content might actually be incorporated into an episode, or get posted on its web site. 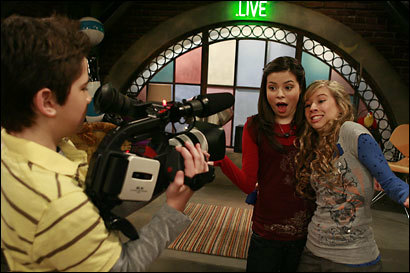 During an episode of the show-within-a-show, Carly will introduce clips supposedly from viewers that have them doing something silly, such as tickling themselves and saying “iCarly” over and over. Some of these clips look professionally produced; others do appear to be from “real” viewers and not just fictional ones.5 That’s a predictable enough gimmick for a TV show about a webcast, but it is also a manifestation of how Nick has connected with a generation of viewers for whom it’s perfectly natural to watch clips of a TV show online as well as have nonlinear editing software installed on their home computer. At the moment, the broadcast networks seem to have passed the sitcom mantel to cable channels that don’t seem to fear that young viewers are averse to the multicamera sitcom. While adult oriented sitcoms have attempted to reinvigorate the genre through formal innovation (The Office, Arrested Development), increased seriality and genre hybridity (Entourage, Weeds) fairly standard multicamera sitcoms like Two and A Half Men continue to garner higher ratings. Perhaps learning from those examples, or perhaps just lacking hang-ups about airing a sitcom, the kid-oriented cable networks have become the home for old school-style sitcoms with their multicamera mode of production and disruption/complication/alleviation narrative structure. Still, I would suggest that iCarly not only uses the “show within a show” series architecture as a way to generate narratives or involve viewers in the series architecture via Web 2.0. The program also looks different from other sitcoms, and to that extent is similar to televisual sitcoms like Arrested Development or The Office.6 iCarly’s premise allows easy integration of comic spectacle a la YouTube’s greatest hits. A typical example is the episode previously mentioned, “iWant a World Record.” When the gang begins their 24 hour webcast, we see Freddy capturing the show with a camcorder, then see what he is capturing through its viewfinder, as a handheld camera enters the space of the performers (not typical for a multicamera sitcom). Occasional cutaway shots show an open laptop, on which we can see a window open with the webcast streaming. Carly welcomes an official to the webcast who is there to validate the world record. She presents Sam with a photo of the world’s fattest priest, which Sam shows to the camera—an incorporation of the sort of random visual jokes that circulate through email into the program’s narrative. 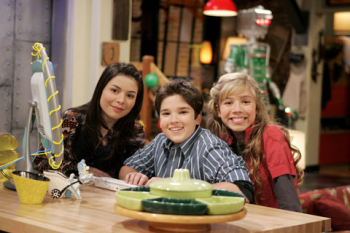 Throughout the webcast an alarm goes off which requires the iCarly cast to engage in “Random Dancing.” During another segment, “Street Fishing,” Carly and Sam reel in a baby (doll) through a window, whose head promptly explodes. Carly introduces the video of a fan tickling himself, and they do another segment titled “Fun with Bacon.” All this takes place during the second act (along with quite a few other things). Every episode includes these show-within-a-show segments, and these offer the most literal examples of providing the sort of comic spectacles available online. In addition to this, the visual style of watching things take place in other spaces through computer or TV screens also affects narrative segmentation outside of the show-within-a-show. During this same second act, the camera cuts to another room where Spencer is attempting to romance the official from the world records book. They watch the webcast on a laptop, while we watch them. Other transitions between segments feature a computer screen with a nonlinear editing program running, and clips that are clicked on and moved, opening up into the next segment. My personal favorite iCarly episode is the hour long “iCarly Saves TV” in which the webcast gets picked up to be a “real” TV show, but is ruined by a meddling executive who adds a dinosaur named Zeebo and a spoiled child star to the cast, amongst other alterations both brazen and lame. As a satire, the episode takes broad shots at television, particularly the out-of-touch male executive and nerdy male writers who seem determined to ruin the show. Zeebo is a Barney clone, something incompatible with iCarly’s audience, which is eager to distance itself from such childish things; the writers appear to be goateed Gen X-ers, similar to those on 30 Rock. If this episode has a satiric target, it’s the generational differences which manifest themselves in their grossly misguided attempts to cater to her audience’s tastes. In the end, about the only thing recommending selling out to the network is its catering service, and Carly returns to the greater autonomy afforded the webcast. There is ultimately not that much subversive about Nickelodeon airing such a broad satire, which was also designed to help launch an iCarly soundtrack album.7 Still, it does suggest just how different the tastes and TV watching habits of this young audience might be from the industry figures which in the past could more easily control what audiences had to choose from. iCarly’s integration of the classic pleasures of the sitcom with the comic anarchy of the web is a convergence comedy whose pleasures can feel quite effortless compared with wading through a cluttered website and sitting through mandatory commercials so you can see a “webisode” starring some of the minor characters on The Office. In fact, it can make such an effort seem downright stodgy. Excellent column, Ethan. I think that your last point brings up an interesting issue. The Office webisodes (and, to use a non-comedic example, The Wire’s short “prequels” offered on Amazon before the start of season 5) seem to betray a somewhat begrudging–or at least indifferent–obligation to internet-based content rather than a holistic extension of their narratives online. I don’t necessarily mean this as a criticism, as those webisodes are entertaining enough, and not every show necessarily needs to expand online to such a great extent. However, iCarly seems like an example of a show more or less understanding and making use of its viewers’ online presence, rather than viewing the internet as simply another venue through which to distribute secondary content. I must admit I was quite excited to see an iCarly article in this issue. I’ve only watched the show a few times, but it’s worked its way to my “To-Do” list of paper ideas. I was also struck by the use of convergence media within the show and I appreciate your analysis of how this plays out. Another (more troubling) aspect that I immediately noticed about the show though was the gender aspects (I recognize this isn’t the point of your article, but would still like to point them out). At first I was excited to see a show featuring girls as media producers, however, from the few episodes I’ve seen, it seems that the gender roles are as stereotypical as ever. The boy is actually in charge of the camera and all technical aspects of the show (uploading, editing, filming, etc.) and the girls are the pretty faces in front of the camera (even depicted in the images/video of this article – Freddy is using the computer and the camera, and Harper is playing the guitar). I’m hoping that maybe this was only tin the few episodes i’ve seen. If not though, then I find it incredibly discouraging and frustrating that Nick felt the need to cast a boy character to do all the “technical computer” aspects of the webisodes, rather than enabling the girls to do this themselves. Especially when recent PEW reports have shown that girls are actually more likely to have produced online media than boys. Great article. After stumbling upon iCarly last year I was curious to see how the show would negotiate the webshow within the television show. Jacqueline, while you bring up a valid point about the gender stereotypes, I think it’s important to look at the positives of these kids/actors, creating and producing a show without the guidance of an adult. I find that the show is very encouraging to its audience to produce their own media and while it would be great to have Sam behind the camera instead of the Freddy, the fact that it’s kids instead of adults is what catches my eye. Jacqueline’s point about how Freddie remains the guy behind the camera and Sam and Carly the girls in front of it is a good one, and something I hadn’t thought of. Unfortunately, yes, Freddie is the one doing most of the production, though Sam’s key prop is a remote control that plays various sound FX. Certainly the girls are shown using computers in other ways, but not the editing/shooting of the show. Interesting to consider, however, is the recent announcement that Nick will be producing a line of iCarly video production equipment/”toys” that seem to be marketed to girls. From my brief perusal of this blog posting they seem to be very affordable, and designed to make posting material to the iCarly site even easier. In short, they are certainly counting on making money from girls wanting to produce their own digital video and still photography, and promoting that sort of “productive” relationship to TV/convergence culture as well. Interesting, thank you for responding and posting the link. I’m going to have to take a look at the iCarly electronic line…very interesting. So, I’ve only seen one episode of iCarly, which was screened for a critical studies television course, but I think the content made an interesting statement about values of iCarly. In the episode, Carly and her team are hired to direct a comeback video for a fading pop star. There’s a clear comparison made between the type of role model Carly represents as opposed to pop stars along the lines of Britney Spears – the obvious inspiration for the character in this episode. The pop star took her fame for granted, made no effort to earn her popularity, and risked Carly’s good reputation. Carly’s goal for the episode was to try to turn things around for the star. Try to convince her to turn her life around, to embrace her craft and become the talented performer she once was. Interestingly things don’t work out that way, and the pop star’s performance nearly goes down in flames. Carly and her friends just try to hide the star’s flaws as much as possible and wash their hands of her when all is said and done. There’s an interesting message here, about what iCarly stands for. Sure, the humor and style don’t appeal to anyone past their tweenage years, but there is a degree of wholsomeness to the show. And I think it’s actually a very positive show for experimenting with convergence. The show asks its viewers to respond in creative and healthy ways. There are rewards for some of the fans if their videos end up in a future episode. As mindless and random as the comedy is, there’s at least an effort to have the audience interact and think about the show. It seems like a very positive exchange that benefits both the show’s creators and audience. I see your point about iCarly’s reinforcement of the stereotype that boys should use machines and girls should stay away from them. But I was surprised and pleased to learn that it’s not another Hannah Montana, in that te audience of the show and the website is only slightly more female than male — boys watch this show too. The fact that it’s not marketed as a show about girl power probably makes it more appealing to boys, who enjoy, as much as girls do, watching capable teens of both genders work together. What struck me about the iCarly website was its message of empowerment as well. Everywhere you look on the page, you’re encouraged to participate: give feedback, vote, ride our elevator, stop what you’re doing and text us, etc. This tells kids that they’re really important to the show, and the show wouldn’t be the same without their participation and self-created content. As unrealistic as the kids’ jobs on the show may be, this is a great overall message.